In response to a request by the Council of Chief State School Officers, this study reports on the gap between American Indian and Alaska Native students and all other students on state achievement tests beginning in 2003–2004, shortly after implementation of the No Child Left Behind Act. The study describes achievement patterns for 8th-grade American Indian and Alaska Native students and all other 8th grade students between 2003–2004 and 2006–2007. Researchers focused on student proficiency in reading and math on state assessments in 26 states serving large populations of American Indian and Alaska Native students. 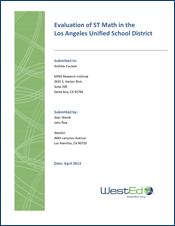 Staff at eight Regional Educational Laboratories (RELs)—Central, Midwest, Northeast and Islands, Northwest, Pacific, Southeast, Southwest, and West—collected the data for this report, including WestEd’s Chun-Wei (Kevin) Huang. Information about the REL system and other REL publications can be found at the National Regional Educational Laboratory Program.